Located at the Fair Oaks Mall, in Fairfax, Virginia, Cheecha’s Fresh & Healthy serves innovative new creations of premium chopped salads alongside mouthwatering classic grilled kabobs. Cheecha’s is the perfect place to gather for a bite to eat. We use only fresh and finest local ingredients to prepare the best quality meals. In addition, we use natural, organic and antibiotic-free products. Fresh is not only associated with our name, it is our promise to you. You can find us at www.cheechas.com. Our approach is based on the core values of healthy eating and living. We use as many local ingredients as possible and prepare our foods fresh-to-order. This is important to us because our customers demand high-quality food and expect us to use techniques that match the powerful wellness industry. We are dedicated to maintaining the high-quality food preparation standards that our customers respect. We are committed to providing customers with the highest level of customer care, value and satisfaction. We know that healthy eaters do not deprive themselves of food, but focus on making healthier eating choices and staying away from potential contaminants. Cheecha’s foundation is based on the importance of providing fresh and natural foods to our customers so they may be successful in their efforts to maintain good health. Our mission is to help communities stay healthier and stronger by creating access to affordable fresh and healthy food. To help meet this goal, we are very pleased to work with The American Childhood Cancer Organization (ACCO). 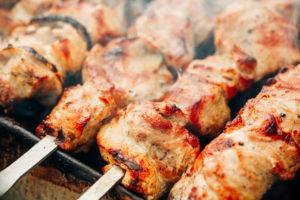 For each signature Chicken Kabob meal sold, we will make a five-cent donation to ACCO. We feel that this fine organization is doing an excellent job for all children suffering from cancer, and we are very pleased to support them in their mission. We will donate additional five-cent to ACCO for each like that we will receive on our Facebook page from ACCO’s friends and supporters. Go Gold®, Go Fresh, for a Healthy Tomorrow!